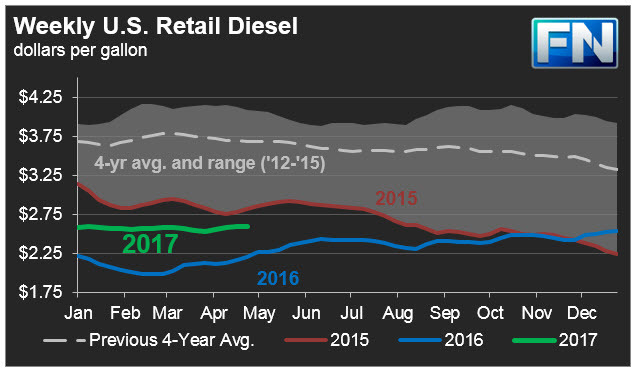 The Energy Information Administration (EIA) released its weekly data on diesel and gasoline retail prices for the week ended May 1st, 2017. Gasoline prices dropped significantly, while diesel prices also declined. For the current week ended May 1st, diesel prices declined by 1.2 cents to an average price of $2.583/gallon. PADD 1 retail diesel prices decreased by 0.8 cents to $2.624/gallon. New England prices rose slightly by 0.3 cents to $2.653/gallon. Central Atlantic diesel prices fell by 1.2 cents to average $2.773/gallon. Lower Atlantic prices decreased by 0.7 cents to average $2.513/gallon. Overall, PADD 1 prices were 31.8 cents/gallon above their prices for the same week last year. PBF Energy will be shutting a 46 kbpd diesel hydrotreater at its 160 kbpd Paulsboro, New Jersey, refinery, for a three- to four-week maintenance period. Phillips 66’s 238 kbpd Bayway, New Jersey, refinery, remains running at low throughput. It was scheduled to restart in mid-March, including its crude unit, its 145 kbpd cat cracker, its cat reformer, and its diesel hydrotreater. But delays pushed back the restart until the 31st, and since then, poor economics have kept throughput low. In the Midwest PADD 2 market, retail diesel prices declined by 1.4 cents to average $2.516/gallon. This price was 28.4 cents/gallon above its level for the same week last year. Tesoro closed its 75 kbpd Mandan, North Dakota, refinery for a full-plant overhaul, earlier than the originally scheduled April 4th date. The overhaul includes a diesel hydrotreater. BP restored normal operations at a 110 kbpd crude unit (one of three crude towers) at its 413.5 kbpd Whiting, Indiana, refinery. BP will close its 55 kbpd diesel hydrotreater during the first half of May for planned maintenance. BP reported last Friday that an accident at a power distribution center sent four workers to the hospital, though refinery operations were not affected. In the Gulf Coast PADD 3, retail diesel prices dropped by 2.3 cents to $2.435/gallon. This price was 29.8 cents higher than in the previous year. Motiva was forced to reduce utilization rates at the 105 kbpd hydrocracker at its 610 kbpd Port Arthur, Texas, refinery. Motiva also was forced to shut its 60 Kbpd diesel hydrotreater. Motiva continues to have issues repairing the H-Oil unit at its 230 kbpd Convent, Louisiana, refinery. Reports indicate that some of the piping infrastructure will need replacement, a process that may take two to three months. In July, Valero plans to shut down the 55 kbpd ULSD hydrotreater at its 293 kbpd Corpus Christi, Texas, refinery for an overhaul. In the Rocky Mountains PADD 4 market, retail diesel prices increased 0.4 cents to $2.666/gallon. This price was 41.1 cents higher than in the prior year. In the West Coast PADD 5 market, diesel prices at the pump decreased by 1.1 cents to average $2.864/gallon. This price was 38.3 cents above its level last year. Prices excluding California decreased by 1.1 cents to $2.775/gallon, which was 41.8 cents above the retail price for the same week last year. California diesel prices decreased by 1.0 cents to an average price of $2.937/gallon, 35.8 cents higher than last year’s price. Valero was forced to shut down the 34 kbpd hydrocracker at its 145 kbpd refinery at Benicia, California for unplanned repairs, which have extended beyond original estimates. Shell is preparing for maintenance at the 42 kbpd hydrocracker at its 165 kbpd Martinez, California, refinery, to commence at the end of April or early May. BP shut the 65 kbpd hydrocracker at its 225 kbpd Cherry Point, Washington, refinery for an overhaul. The larger, 55 kbpd, cat reformer remain in service. PBF Energy reduced throughput at the 88 kbpd VGO hydrotreater at its 149 kbpd Torrance, California, refinery, for more unplanned repairs. This unit is scheduled for a seven-week overhaul in late April/Early May. The hydrocracker is scheduled for a five-week overhaul. 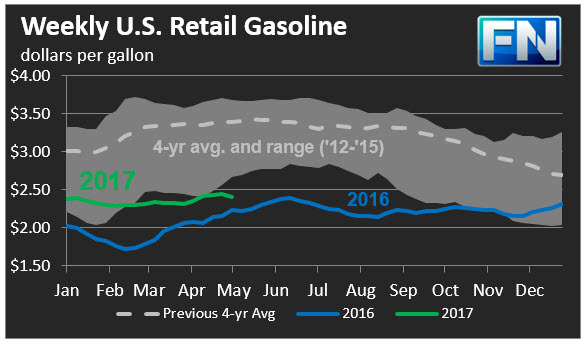 US retail gasoline prices dropped significantly by 3.8 cents for the week ended May 1st, to $2.411/gallon. This price was 17.1 cents higher than for the same week in 2016. Gasoline prices had been rising steadily until this week. In the East Coast PADD 1, prices for gasoline fell by 2.9 cents to $2.387/gallon. This price was 17.2 cents higher than last year’s price. Prices edged down by 0.1 cents in New England to $2.403/gallon. Central Atlantic market prices decreased by 2.3 cents to $2.496/gallon. Prices in the Lower Atlantic market dropped significantly by 4.3 cents, to bring prices to an average of $2.30/gallon, which was 13.7 cents higher than last year’s average price. PBF Energy began to restart the 82 kbpd cat cracker at its 182.2 kbpd Delaware City refinery. In the Midwest PADD 2 market, retail gasoline prices dropped sharply by 6.8 cents to average $2.29/gallon. Gasoline pump prices were 10.7 cents higher than they were one year ago. Tesoro closed its 75 kbpd Mandan, North Dakota, refinery for a full-plant overhaul after a power outage and steam plant failure. The refinery includes a cat cracker and a cat reformer. The overhaul was originally scheduled for April 4th. Phillips 66 closed for unplanned repairs the smaller of its cokers, 20 kbpd, at its 314 kbpd Wood River, Illinois, refinery. In the Gulf Coast PADD 3 market, gasoline prices fell by 2.9 cents to average $2.196/gallon. Prices for the week were 20.1 cents higher than for the same week in 2016. Citgo experienced delays overhauling the 46 kbpd cat cracker at its 425 kbpd Lake Charles, Louisiana, refinery, and reportedly successfully restarted the unit. Motiva continues to have issues repairing the H-Oil unit at its 230 kbpd Convent, Louisiana, refinery. Placid Refining reduced crude runs and moved up a five-week overhaul of the 25 kbpd cat cracker and related operations at its 75 kbpd Port Allen, Louisiana, refinery. Phillips 66 suffered a breakdown at the lone, 105 kbpd cat cracker at its 247 kbpd Belle Chasse, La., refinery. In the Rocky Mountains PADD 4 region, gasoline prices decreased 0.9 cents to average $2.404/gallon. This price was 23.7 cents higher than at the same time in 2016. In the West Coast PADD 5 market, retail gasoline prices declined by 1.2 cents to an average price of $2.879/gallon. This was 24.4 cents higher than at the same time a year ago. Excluding California, prices decreased by 0.6 cents to an average of $2.668/gallon. This was 33.4 cents higher than at the same time in 2016. In California, prices fell by 1.5 cents to an average pump price of $3.002/gallon. California remained the only state market to have gasoline prices above $3/gallon. Prices were 19.3 cents higher than last year’s price for the same week. Los Angeles prices fell by 2.4 cents to average $3.03/gallon. San Francisco pump prices decreased by 0.2 cents to average $3.055/gallon, 20.4 cents above last year’s price. Seattle prices fell 1.0 cents to average $2.887/gallon, 49.4 cents higher than prices one year ago. Chevron shut the 49 kbpd cat reformer at its 273 kbpd El Segundo, California refinery for unplanned repairs, which are expected to be completed by approximately May 5th. Tesoro’s 100 kbpd Wilmington, California, refinery experienced a power interruption on Wednesday, bringing down the 35 kbpd cat cracker, the 22 kbpd hydrocracker, two reformers, and various hydroprocessing units.